Editorials from Theslowlane: Shopping: Your Patriotic Duty? Scenes from my bike trip down the coast. 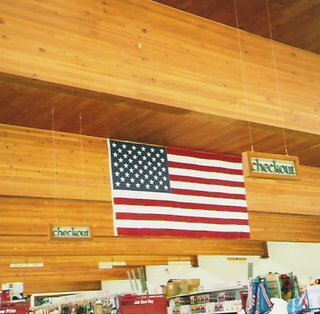 Red and white stripes of the American flag fit well with horizontal lines of these laminated beams in the store ceiling. I am not much of a shopper so I notice other things, like the architecture of the store building. Saw this interesting ceiling in a store on my 2006 bike tour down the California coast. I think it was in Manchester, CA. Makes a good image as people do the Christmas Shopping Season. Not having kids, I am not much of a shopper. I remember when I was a kid, I felt cheated if I didn't get as many toys under the tree as my older sister. She got more packages because she had friends up the street. They gave her stuff as well as the stuff we all got from mom and dad. Now that I am older, I realize that friendships are valuable even if it doesn't necessarily mean more toys. There is more to life than shopping, but a kid might not comprehend that as easily. Amazing that shopping is a pastime for many folks. Not much else to do in "small town" America. Not much that's social at least. On my trips, I keep seeing places that sell hot tubs. They are always selling hot tubs, but there is practically never a place where people gather to use the hot tub. Imagine what the world would be like if all those hot tub stores where actually places where people went to relax in a hot tub and enjoy conversation with one another. I find the best philosophical conversations in places like saunas and hot tubs. Places for deep conversation are rare in our society. We usually just find places to buy the hot tub and bring it home as another piece of clutter around the house. Something more to need maintenance. Something more so the "house can own you." "Would you like that in a paper or plastic bag?" Does the store clerk really feel connected after discussing that topic all day with hundreds of folks? By the way, in answer to that "paper or plastic" question, I surprise some environmentalists by preferring plastic bags. They hold up better in the rain while walking or bicycling. Since mainstream society drives cars, they might not notice the propensity of paper bags to deteriorate in the rain. I have used canvas bags. Many stores sell them with the store logo on the side. They make nice tote bags also. Yes, you do have to remember to bring them to the store.